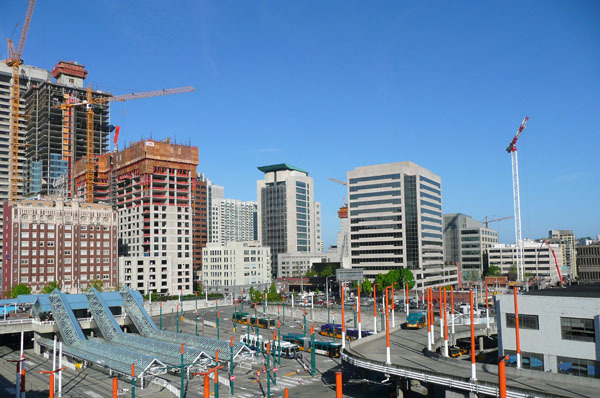 Can you find six construction cranes in this view looking northwest from Pine and Boren? If you’re not an advanced cranespotter, here’s a hint: there’s one that’s not quite legible at this resolution just above the building rooftops at the far right of the photo. Bonus: Can you name each project? Olive8 is an easy one. Others? Not Dubai, but still, that’s a whole lotta building going up in a relatively small area. It will be interesting to see the absorption rates when all these buildings (and many others currently under construction in Seattle) come on line during what will likely still be an economic downturn. Posted by dan bertolet on	Saturday, May 17th, 2008 at 8:28 am. You can follow any responses to this entry through the RSS 2.0 feed. You can leave a response, or trackback from your own site. I know the Olivian and West 8. I think the hard to see crane is for Enso but I’m not sure. Olive 8 is on the far left. The only one I don’t know is the close one on the right. The white crane on the right is for Aspira, 38 or so story apartments.